Linton had a workhouse from around 1724 (Hampson, 1934; Murphy, 1978). A parliamentary report of 1777 recorded parish workhouses in operation in Linton (for up to 23 inmates) and Whittlesford (40 inmates). 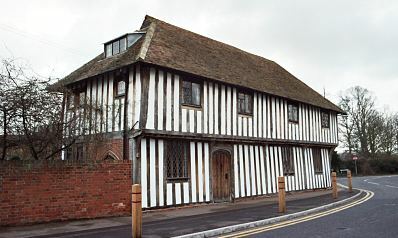 The Guildhall on North Road in Whittlesford was used as the parish workhouse from the early 1600s, and also occasionally as a school room. Whittlesford former parish workhouse, 2004. County of Cambridge: Babraham, Balsham (2), Bartlow, Carlton, Castle Camps, Duxford, Great Abington, Hildersham, Hinxton, Horseheath, Ickleton, Linton (3), Little Abington, Pampisford, Sawston, Shudy Camps, Weston Colville, West Wickham, West Wratting, Whittlesford. County of Essex: Hadstock, Little Bartlow. The population falling within the Union at the 1831 census had been 11,587 ranging from Great Bartlow (population 106) to Linton (1,678). The average annual poor-rate expenditure for the period 1832-35 had been £10,547 or 18s.2d. per head. 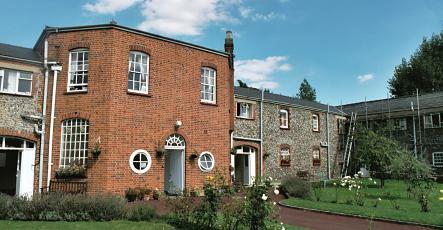 Linton Union workhouse was built in 1836-7 on the north side of Symonds Lane in Linton. The Poor Law Commissioners authorised an expenditure of £5,878 on construction of the building which was intended to accommodate up to 230 inmates. It was designed by architects Messrs Hallet and Newman of Middlesex was a variation on the popular cruciform or "square" plan. Its location and layout are shown on the 1903 map below. Linton workhouse from the south-west, c.1905. Linton workhouse from the south-west (detail), c.1905. 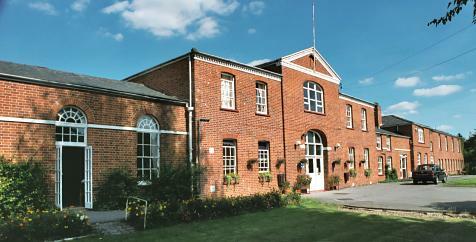 Linton entrance block from the south-west, 2001. To the rear, a central octagonal hub would have contained the Master's quarters with windows to provide views in all directions. Ranges radiated from the hub although at Linton this was only in three directions rather than the more usual four. The eastern range appears to have contained a chapel which may also have served as a school-room. Linton central hub from the south-west, 2001. Linton north and west ranges from the north-west, 2001. Further accommodation blocks around the outside gave a square perimeter to the buildings. Workshops and utility rooms such as a laundry and bakehouse would probably have been situated at the rear side. 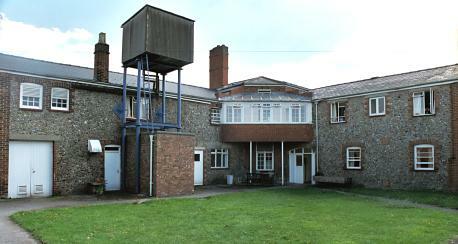 The former Linton workhouse buildings are now used as an old people's home. Cambridge Archives and Local Studies, Box SH 1009, Shire Hall, Castle Hill, Cambridge CB3 0AP. Holdings include: Births (1913-32); Guardians' minutes (1835-1930); etc. Hampson, E.M. (1934) The Treatment of Poverty in Cambridgeshire, 1597-1834 (Cambridge Studies in Economic History; CUP). Murphy, M.J. (1978) Poverty in Cambridgeshire (Cambridge Town, Gown, and County; Oleander Press).